Monday April 20th 1896 There was a heavy rain early this morning. After it cleared away Will helped me wash. I worked a little on my cape and took the clothes in and got them ready to iron. Looked after chickens that were hatching. I was very tired and went to bed early. Tuesday April 21st 1896 I ironed and got dinner early. Will and I went to town. After attending to my errand I walked over the river. Mother and Hattie had gone to town. I went on down to see Fanny. We come home early. I set more hens, put away the ironed clothes. After supper I did the mending. Wednesday April 22nd 1896 I sewed all the time I could spare from my regular work. It was cooler today. The boys are plowing. 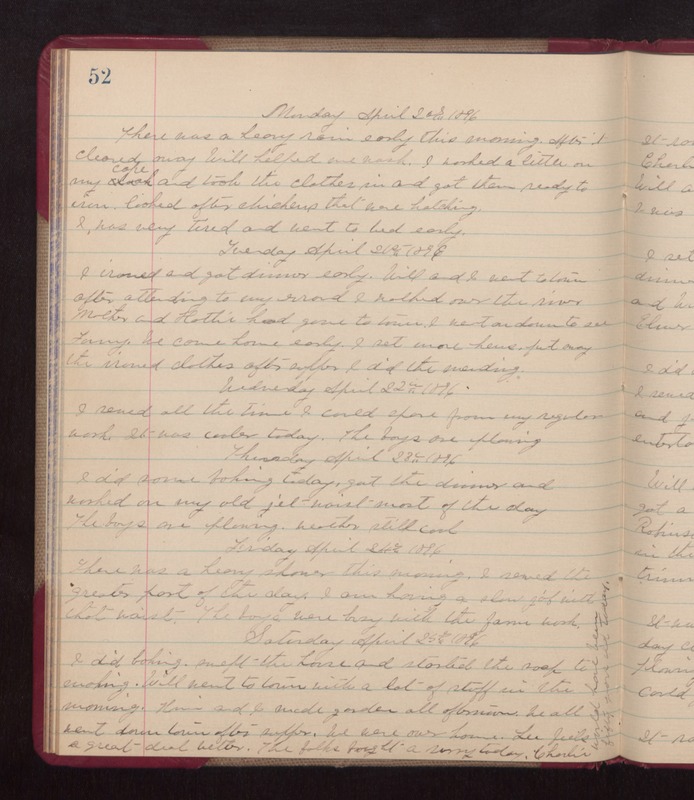 Thursday April 23rd 1896 I did some baking today, got the dinner and worked on my old jet waist most of the day. The boys are plowing. weather still cool. Friday April 24th 1896 Thee was a heavy shower this morning. I sewed the greater part of the day. I am having a slow job with that waist. The boys were busy with the farm work. Saturday April 25th 1896 I did baking, swept the house and started the soap to making. Will went to town with a lot of stuff in the morning. Him and I made garden all afternoon. We all went down town after supper. We were over home. Lee feels a great deal better. The folks bought a surry today. Charlie would have been fifty years old today.